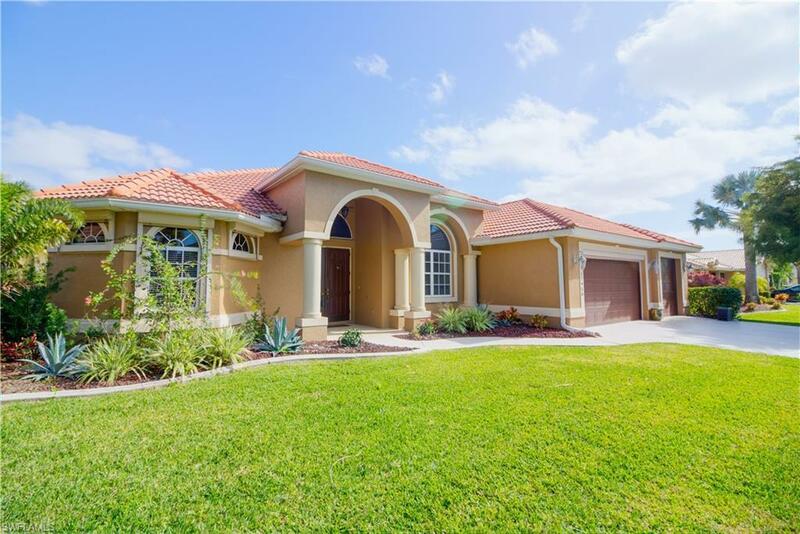 Beautiful Open Floor Plan Executive Home located on one of the most desired areas in Cape Royal! This 4/3/3 is simply gorgeous with all of the upgrades already there for you including a newer top of the line 5 ton Carrier variable speed AC system. Electric storm shutters across entire lanai, 'skeeter screened' garage door, two newly installed garage door motors, upgraded spacious kitchen with granite and contrasting center island with electric stove top. This beautiful open floor plan is perfect for entertaining, while overlooking the lanai, pool, golf course and lake. Enjoy the convenient Cabana Bath that leads to the pool for the huge bonus room (office, gym + guest room (Murphy Bed) the pool cage has been fully updated:re-screened with extra strong screening and professionally refinished. The Cape Royal community boasts over 20 lakes, many activities for all ages. BONUS: this is Lee County only...so no Cape Coral taxes, water bills or assessments! PLUS LOW Annual HOA's under $100 a month! Offering the most SQFT at the lowest price in Cape Royal. See it today before its gone!